» Drug-coated Balloons in the Femoropopliteal Region: Dream or Reality? Drug-coated Balloons in the Femoropopliteal Region: Dream or Reality? Peripheral arterial disease is a severe pathology. Several methods have been tested in order to increase the patency rate and the quality of life. The superficial femoral artery is considered a very difficult region due to the continuous movement of the leg that modify the length and the morphology of this vessel. 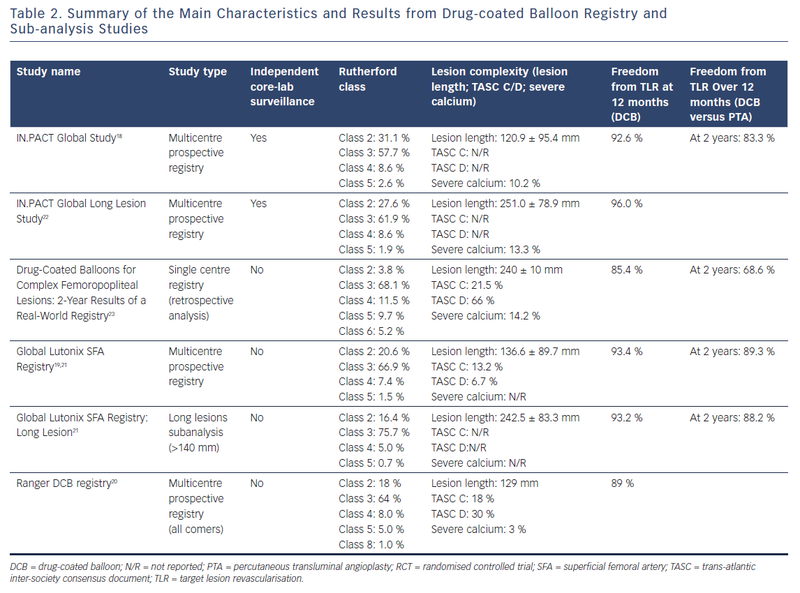 Since their introduction, drug-coated balloons have been correlated with an increased patency rate. Several studies have been performed and nowadays a level 1 evidence is available. Not all the lesions can be treated successfuly with drug-coated balloons. For example in case of heavely calcified lesions vessel preparation is required. This can be performed with atherectomy, scorig balloon, lithoplasty in order to debulk the lesion and increase the drug uptake. Vascular & Endovascular Review 2018;1(1):8–11. Since their introduction in Europe in 2008, drug-coated balloons (DCBs) have increasingly been used for lower limb revascularisation. Following initial excellent results reported in the literature, many physicians started to use DCBs daily as a first-line therapy in the femoropopliteal region, supported by level 1 evidence.3,4 DCBs achieve high rates of primary patency (PP), compared with alternative therapies, with a limited use of provisional stents. DCBs act on the smooth muscle cells reducing intimal hyperplasia and the risk of restenosis. In recent years many clinical studies have been performed comparing DCBs with conventional percutaneous transluminal angioplasty (PTA). All of these studies have shown superiority of DCBs in late lumen loss (LLL) and in PP. More than 13 DCBs are available on the market in Europe, but not all of them have been evaluated with robust clinical studies. More recently many other studies have confirmed similar results, not only after 12-month follow-up, but also after 24 and 36 months.7–15 1-year PP was 89.5 % in the Pivotal Trial of a Novel Paclitaxel-Coated Percutaneous Angioplasty Balloon (ILLUMENATE),10,11 82.2 % in the Randomized Trial of IN.PACT Admiral® Drug Coated Balloon vs Standard PTA for the Treatment of SFA and Proximal Popliteal Arterial Disease (INPACT SFA),12 73.5 % in the Moxy Drug Coated Balloon versus Standard Balloon Angioplasty for the Treatment of Femoropopliteal Arteries (LEVANT 2) study14,15 and 86.4 % in the Comparison of the Ranger™ Paclitaxel-coated PTA Balloon Catheter and Uncoated PTA Balloons in Femoropopliteal Arteries (RANGER SFA) trial.16 After 2 years of follow-up, PP was 80.3 % for the Stellarex™ DCB, 78.9 % for the IN.PACT® Admiral® DCB (Medtronic) and 58.6 % for the Lutonix® DCB (Bard). Initial analysis of these data underlines the concept of a prolonged effect of paclitaxel, confirmed by the difference in PP when compared with PTA after 2 years of follow-up. Three-year data are also available for the INPACT SFA trial, confirming the long-term efficacy of the DCB balloon versus PTA. A 3-year PP of 69.5 % (versus 45.1 % with PTA) and a clinically driven target lesion revascularisation (CD TLR) of 2.4 % at 1 year, 9.1 % at 2 years and 15.2 % at 3 years (versus a PTA CD TLR of 20.6 %, 28.3 % and 31.1 % at 1, 2 and 3 years, respectively; p<0.05) have been described.17 Table 1 summarises the main characteristics and outcomes of the most recent randomised controlled trials. In the IN.PACT Global Study,18 1,406 patients with Rutherford class from two to four were enrolled. Mean lesion length was 12.09 cm with 35 % total occlusion and 18 % in-stent restenosis (ISR). Freedom from CD TLR (primary endpoint) was 92.6 % at 360 days (evaluated by Kaplan-Meier analysis and adjudicated by an independent clinical event committee). Table 2 summarises the main characteristics and outcomes of the real-world registries. Although all DCBs use paclitaxel as the active drug, multiple technical differences exist between each DCB, such as drug dose (ranging from 2 μg/mm2 to 3.5 μg/mm2), formulation (crystalline versus amorphous), excipient type and coating technology. The ‘correct’ drug dose is under discussion. The drug dose on the balloon surface ranges from 2 μg/mm2 to 3.5 μg/mm2 but the optimal dose is not defined. It is queried whether drug dose should differ according to the patient’s condition (for instance, if they have diabetes or not) or according to the lesion morphologic characteristics (more or less calcific), the type of lesion (stenosis or occlusion) and the lesion length. Moreover, the actual drug dose that is released at the level of the target lesion cannot be precisely evaluated in vivo. This value depends on the lesion location, the time of exposure of the catheter to the blood flow, the lesion morphology, and so on. Gongora et al. evaluated the arterial paclitaxel tissue concentration profiles over time for the IN.PACT Pacific, the Lutonix and the Ranger DCBs.24 Despite the different drug dose, all of the DCBs displayed similar levels of drug tissue concentration following inflation. However, after 24 hours, paclitaxel drug tissue concentration levels decreased to ~20 ng/mg for both IN.PACT and Ranger and to ~5 ng/mg for the Lutonix. At seven days, drug tissue concentration levels for IN.PACT and Ranger decreased to ~50 % and to ~1–2 ng/mg for Lutonix. IN.PACT and Ranger drug tissue concentration levels dropped to ~1–2 ng/mg after 30 days. DCBs represent an important innovation and established technique in the treatment of atherosclerotic disease of the femoropopliteal region. However, not all the DCBs are the same. 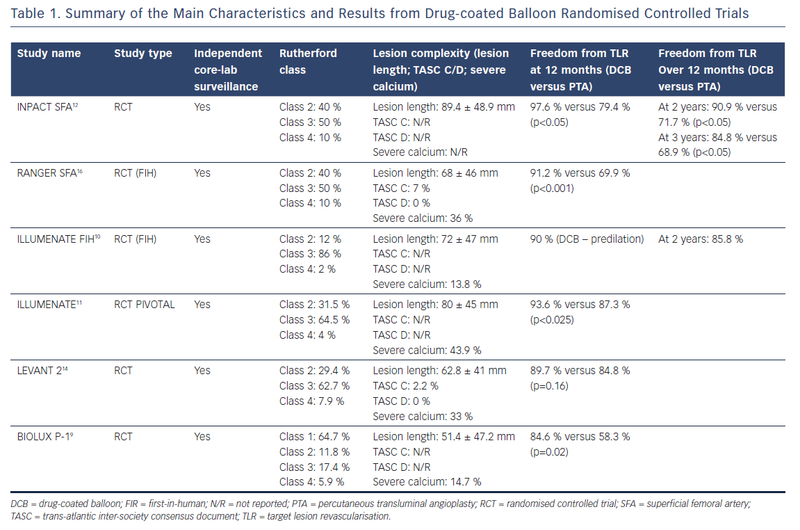 Despite the use of the same drug, results are correlated with the technical characteristics of each balloon. Therefore, a ‘no class effect’ has been introduced and each DCB must stand on its own merit. This important concept should be kept in mind when choosing a DCB. We look forwards to further studies providing interesting and important data to confirm the safety and efficacy of this technology and help us to solve the still unanswered questions. Fowkes FG, Rudan D, Rudan I et al. 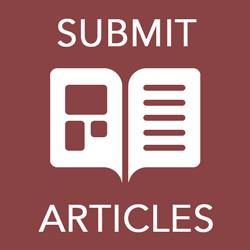 Comparison of global estimates of prevalence and risk factors for peripheral artery disease in 2000 and 2010: a systematic review and analysis. Lancet 2013;382:1329–40. Cortese B, Granada JF, Scheller B, et al. Drug-coated balloon treatment for lower extremity vascular disease intervention: an international positioning document. Eur Heart J 2016;37(14):1096–103. Biondi-Zoccai G, Sangiorgi G, D’Ascenzo F, et al. Drug-eluting balloons for peripheral artery disease: a meta-analysis of 7 randomized clinical trials and 643 patients. Int J Cardiol 2013;168:570–1. Werk M, Langner S, Reinkensmeier B, et al. Inhibition of restenosis in femoropopliteal arteries: paclitaxel-coated versus uncoated balloon: femoral paclitaxel randomized pilot trial. Circulation 2008;118:1358–65. Tepe G, Zeller T, Albrecht T, et al. Local delivery of paclitaxel to inhibit restenosis during angioplasty of the leg. N Engl J Med 2008;358:689–99. Tepe G, Schnorr B, Albrecht T, et al. Angioplasty of femoral-popliteal arteries with drug coated balloons: 5-year follow-up of the Thunder trial. JACC Cardiovasc Interv 2015;8(1 Pt A):102–8. Werk M, Albrecht T, Meyer DR, et al. Paclitaxel-coated balloons reduce restenosis after femoro-popliteal angioplasty: evidence from the randomized PACIFIER trial. Circ Cardiovasc Interv 2012;5:831–40. Scheinert D, Duda S, Zeller T, et al. The LEVANT I (Lutonix Paclitaxel-Coated Balloon for the Prevention of Femoropopliteal Restenosis) Trial for Femoropopliteal Revascularization: First-in-Human Randomized Trial of Low-Dose Drug-Coated Balloon Versus Uncoated Balloon Angioplasty. JACC Cardiovasc Interv 2014;7:10–9. Scheinert D, Schulte KL, Zeller T, et al. Novel paclitaxel releasing balloon in femoropopliteal lesions: 12-month evidence from the BIOLUX P-I randomized trial. J Endovasc Ther. 2015;22(1):14-21. Schroeder H, Meyer DR, Lux B, et al. Two-year results of a low-dose drug-coated balloon for revascularization of the femoropopliteal artery: outcomes from the ILLUMENATE first-in-human study. Catheter Cardiovasc Interv 2015;86(2):278–86. Krishnan P, Faries P, Niazi K, et al. Stellarex Drug-Coated Balloon for Treatment of Femoropopliteal Disease: Twelve-Month Outcomes From the Randomized ILLUMENATE Pivotal and Pharmacokinetic Studies. Circulation 2017;136(12):1102–13. Tepe G, Laird J, Schneider PA, et al. Drug-Coated Balloon versus Standard Percutaneous Transluminal Angioplasty for the Treatment of Superficial Femoral and/or Popliteal Peripheral Artery Disease: 12-month Results from the IN.PACT SFA Randomized Trial. Circulation 2015;131:495–502. Laird JR, Schneider PA, Tepe G, et al. Durability of Treatment Effect Using a Drug-Coated Balloon for Femoropopliteal Lesions: 24-Month Results of IN.PACT SFA. J Am Coll Cardiol 2015;66(21):2329–38. Rosenfield K, Jaff MR, White CJ, et al. Trial of a Paclitaxel coated balloon for femoropopliteal artery disease. N Engl J Med 2015;373(2):145–53. Jaff MR, Rosenfield K, Scheinert D, et al. Drug-coated balloons to improve femoropopliteal artery patency: rationale and design of the LEVANT 2 trial. Am Heart J 2015;169(4):479–85. Schneider PA, Laird JR, Tepe G, et al. ; IN.PACT SFA Trial Investigators. DCB show superior 3-year outcomes vs. PTA: results from In.Pact SFA randomized trial. Circ Cardiovasc Interv. 2018;11(6):e006699. Micari A, Brodmann M, Keirse K, et al. Drug-Coated Balloon Treatment of Femoropopliteal Lesions for Patients With Intermittent Claudication and Ischemic Rest Pain: 2-Year Results From the IN.PACT Global Study. JACC Cardiovasc Interv 2018;11(10):945–53. Schmidt A, Piorkowski M, Görner H, et al. Drug-coated balloons for complex femoropopliteal lesions: 2-year results of a real-world registry. JACC Cardiovasc Interv. 2016;9(7):715-24. Lichtenberg M, von Bilderling P, Ranft J, et al. Treatment of femoropopliteal atherosclerotic lesions using the ranger paclitaxel-coated balloon catheter: 12-month results from an all-comers registry. J Cardiovasc Surg (Torino) 2018;59(1):45–50. Thieme M, Von Bilderling P, Paetzel C, et al. The 24-Month Results of the Lutonix Global SFA Registry: Worldwide Experience With Lutonix Drug-Coated Balloon. JACC Cardiovasc Interv 2017;10(16):1682–90. Micari A, Vadalà G, Castriota F, et al. 1-Year Results of Paclitaxel-Coated Balloons for Long Femoropopliteal Artery Disease: Evidence From the SFA-Long Study. JACC Cardiovasc Interv 2016;9(9):950–6. Schmidt A, Piorkowski M, Görner H, et al. Drug-Coated Balloons for Complex Femoropopliteal Lesions: 2-Year Results of a Real-World Registry. JACC Cardiovasc Interv 2016;9(7):715–24. Gongora CA, Shibuya M, Wessler JD, et al. Impact of Paclitaxel Dose on Tissue Pharmacokinetics and Vascular Healing: A Comparative Drug-Coated Balloon Study in the Familial Hypercholesterolemic Swine Model of Superficial Femoral In-Stent Restenosis. JACC Cardiovasc Interv 2015;8(8):1115–23.